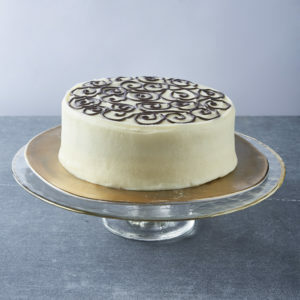 Learn how to make our signature Cream Cheese Frosting with various flavour adaptations and perfect your icing technique with our step by step guide. If making raspberry or blackcurrant frosting from whole fruit, heat the fruit until the juices run, then blitz with a handheld blender. Boil until reduced by half, then pass it through a fine sieve to remove the seeds and leave to cool. Put the cream cheese, icing sugar and any flavouring into a bowl and beat slowly with a handheld electric mixer until smooth. Put the butter in a small pan and soften over a very low heat so that it just disintegrates rather than becoming piping hot. With the hand mixer still on a slow speed, gradually pour the melted butter into the cream cheese mixture until it is completely combined, then whisk it briefly at a higher speed. If you’re happy with the consistency use it straight away. If the butter was too warm, the frosting may be a bit soft and will need chilling slightly first. First spread a thin layer of frosting over the top and sides to bind the crumbs, using a palette knife. 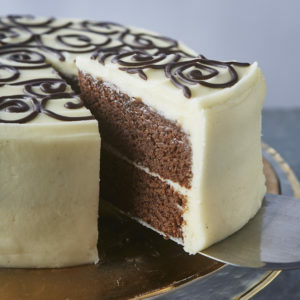 Chill the cake for 1 hour, then spread the rest of the frosting over the top and down the sides. 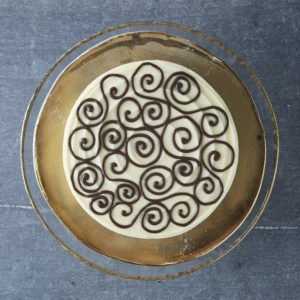 If you use a cake turntable, give it a spin at the end with the tip of the palette knife pressed on to the top of the cake to create a spiral swirl. Place the cake in the fridge to set.